The latest edition of the Lonely Planet travel guide to Greece is a comprehensive 750-page guidebook to the whole country. When it comes to guides to the whole of Greece, there are in our view only two contenders: Lonely Planet and Rough Guides. Other series may be good for different things, or for certain places. A guide to the entire country is never going to cover Athens, say, as well as a dedicated guide to Athens. But for comprehensive coverage of everywhere, Rough Guides and Lonely Planet are hard to beat. We’ve already reviewed the Lonely Planet guides to Crete and to the Greek Islands. 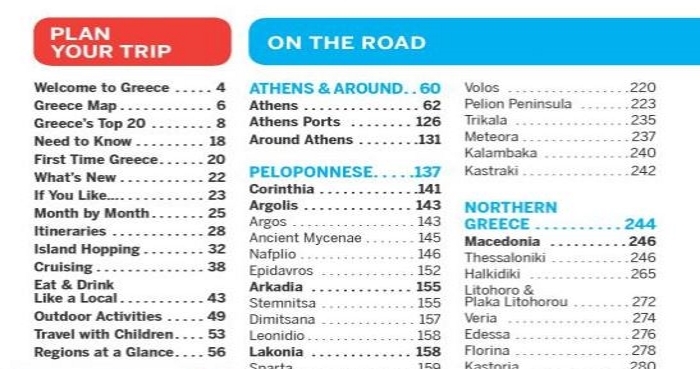 The latest guide to the whole of Greece from Lonely Planet weighs in at 750 pages and covers Greece from Avdira (a small town and archaeological site in Thrace) to Zia (a mountain village on the island of Kos). 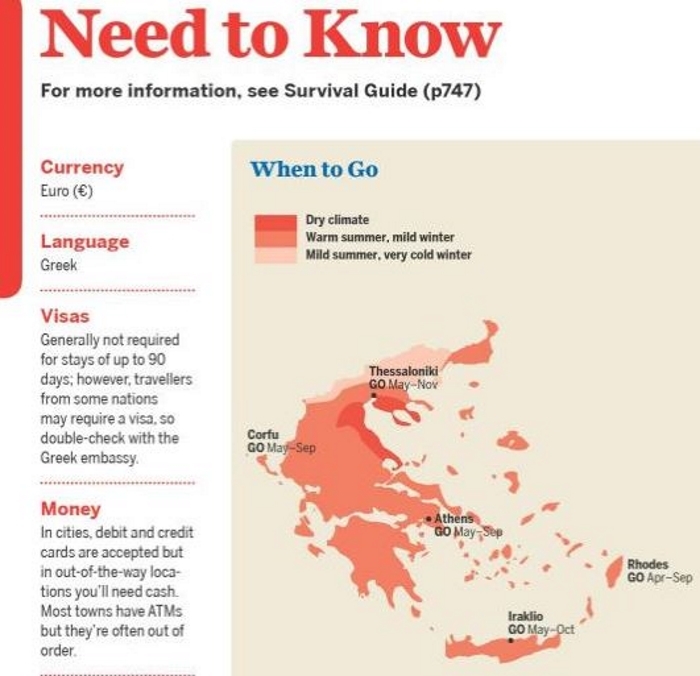 After an introduction and an overview map, the guide begins with Greece’s Top Twenty. Picking only twenty places to represent the best of Greece is no easy task, but it would be hard to argue with the choices here, including the Acropolis, Meteora, Delphi, the Samaria Gorge, Knossos and Cretan Cuisine. We’re especially pleased to see that last one as we’ve been to Crete many times and the food and wine there just gets better and better. 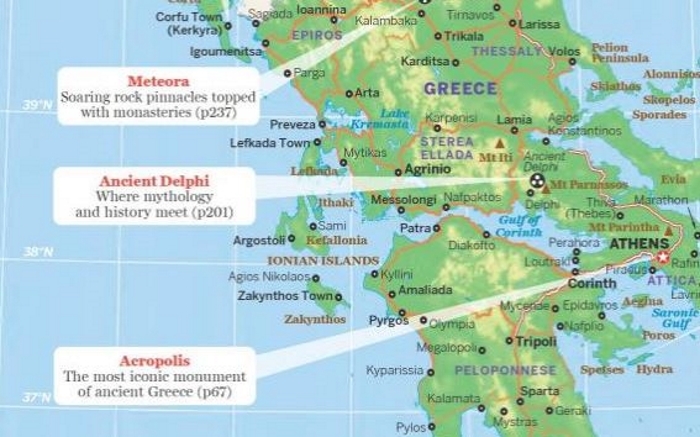 There are three suggested itineraries, if you have 2-3 weeks to devote to Greece. First is a 2-week Grand Tour, which we have to say is definitely overly ambitious. No-one should attempt to take in everything on this trip. You would be totally exhausted and have very little time in each of the suggested places. 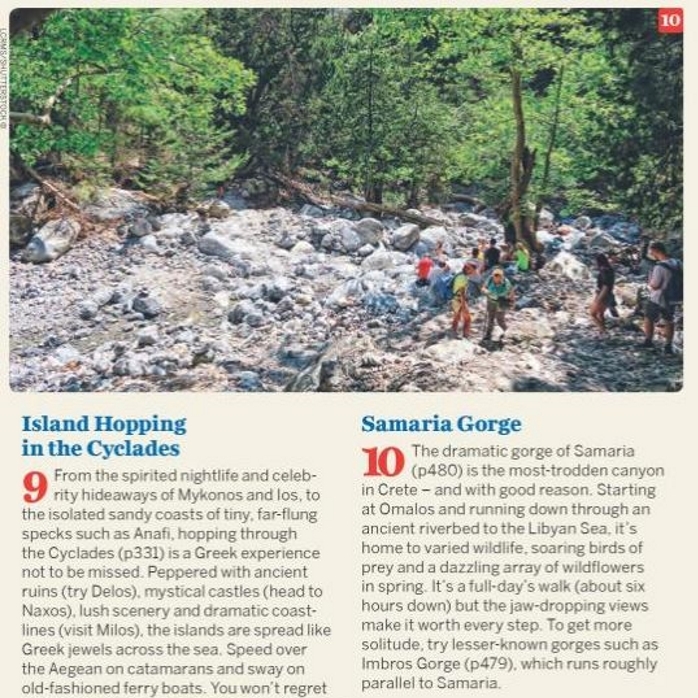 Although if you do attempt it you’ll tick off many of Greece’s Top 20 places in one go. More leisurely and more sensible are the other two itineraries, which are two weeks covering Crete and the Dodecanese, and three weeks visiting the Ionian Islands and the Peloponnese. In the spread on Island Hopping there’s another suggested island hopping itinerary for 2-3 weeks, although in our view the whole purpose of island hopping is to be totally unplanned and go wherever the fancy (and the ferry) takes you. Other feature spreads to help you plan your trip to Greece cover cruising, cuisine, outdoor activities, travelling with children and a month-by-month guide to the main events in the Greek calendar. 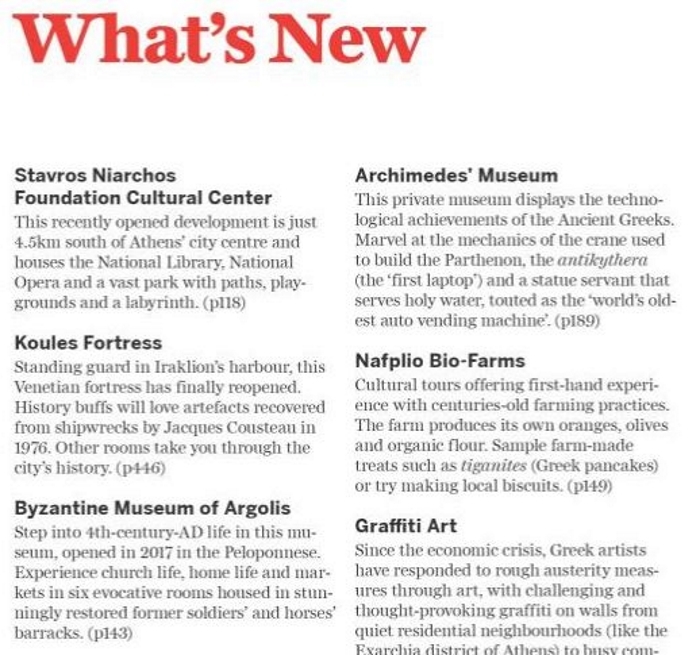 At the back of the book a section called Understand covers topics that help you appreciate different aspects of Greece and Greek culture, such as history, architecture, the arts and wildlife. We checked another of our favourite places, the town of Zaros on Crete, and the description here is spot on. We’re delighted they single out Vegera as a place to eat. Our meal there was memorable, and the atmosphere was exactly as the book describes. Most places get comprehensive coverage, with everything you need to know – what to do, where to stay, where to eat, activities, shopping, nightlife, local transport and how to get there in the first place. This level of information is impressive – buses, ferries and flights are all covered in great detail. Even the bus fares are listed, although these will inevitably change a little during the life time of the book. Is Lonely Planet Greece Worth Buying?